To celebrate Lily's Birthday I have teamed up with some great companies this week to bring you some great gift ideas with reviews of the product and a giveaway. Today is day 1 of the Lily's gift guide and giveaway and I have a Busy Me, Lets Do the Dishes Set up for grabs. Lily really loves role play and one of the things she has been wanting to do recently is wash up. She does have a little sink in her kitchen where she can pretend to do this. But the Addo Lets do the Dishes set just provides that little bit more encouragement to get doing the dishes. I did really like how it was all laid out in the rack. 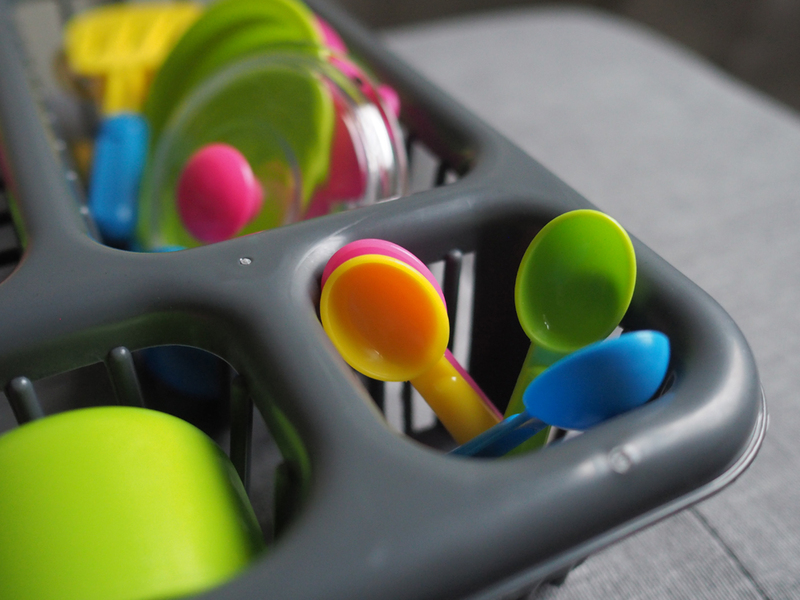 With separate place for the spoons and separate place for the cups and plates. Was really good that it could teach Lily how to be organised and tidy. 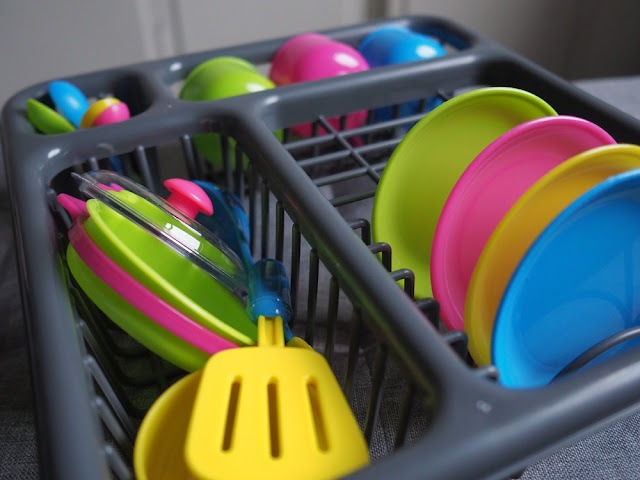 All the items were really colourful and so Lily could not wait to get doing the dishes. 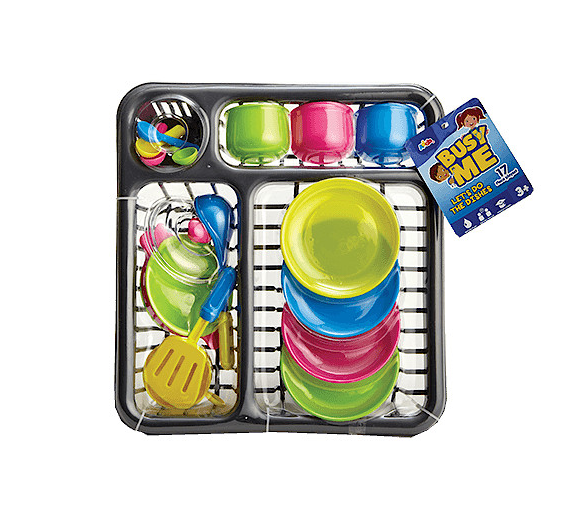 This set is great to Lily to use with her kitchen and she can pretend that she is washing up. 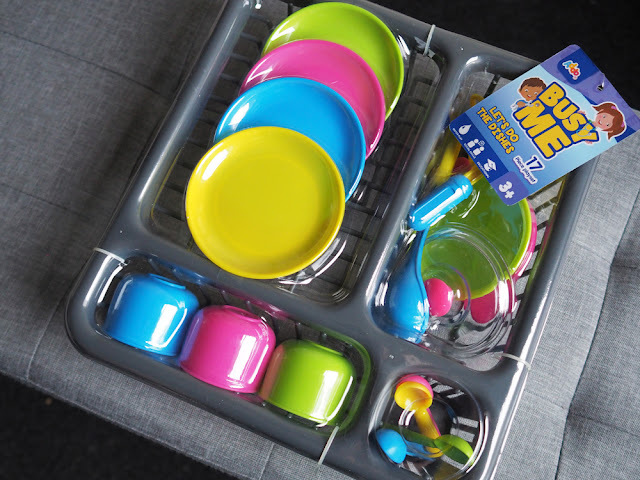 But this is also a really good set to do a real washing up activity for kids. Children love playing in water and so something which is a annoying house hold job for us, is really good fun for them. So when I told Lily I was getting a bucket of water for her to do the washing up in, she got really excited and literally jumped up and down shouting "YEY". If only we kept hold of that excitement into adulthood!! So I filled up some water for Lily and I popped all the items from the drying rack into the water. I rolled up her sleeves and gave her a sponge and let her wash up her dishes. She loved it and knew exactly what do to. These plates and cups are perfect for washing, they are simply plastic and don't have any stickers on so are ideal for getting wet. After she had done them all and put them back into the drying rack. (Into the correct places I may add) She wanted to do it all over again. So emptied them back into the water. This toy provides so much fun for kids and is such a great birthday gift to help with the imagination. You can buy this toy from The Entertainer for £13.99, though it is currently on sale at £6.50!! Which is a bargain! 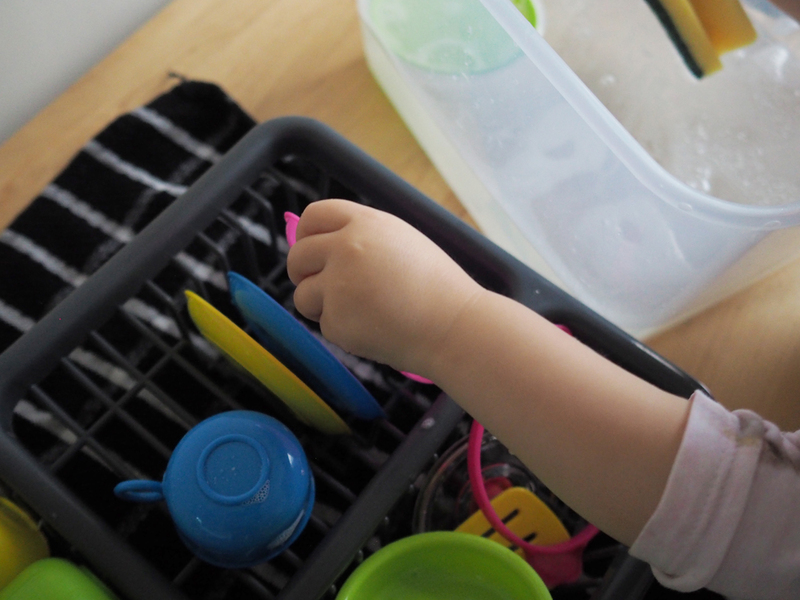 Does your child enjoy doing the dishes? Enter the Gleam app below to enter to win a set. Don't forget to head back tomorrow to enter another great giveaway. my kids love helping with the washing up but they're a bit older now, my niece Kirsty however is still young, she would love this and loves doing any job my sister in law does! Yes, my two girls enjoy it! All kids love washing up with all those bubbles, don't they? No - mine hate washing up! it is a novelty for our little Grandson as he has a dishwasher at home, so washing up in a bowl by hand when he is with us seems great fun! Yes, and long may it last. My 3yo loves to help with the washing up at Nannies but she isn't tall enough even with a stall at home! My God-Children used to love doing the dishes as they got to sit on my special chair as I have a disability so I have chairs everywhere. Yes my daughter absolutely loves it even though she gets drenched! my great niece would love this! she love to pretend cook and play in water. Fab for the little ones! My grandson would love this as he loves to play in water. Yes, and we do enjoy spending time together:- Tasks do tend to take more time. But we try to make the tasks fun by including music, etc. Yes, but they love making a mess with water more. My youngest son loves to help wash the dishes with me. Yes and also clearing the dinner table so i'm quite lucky i have a helper. 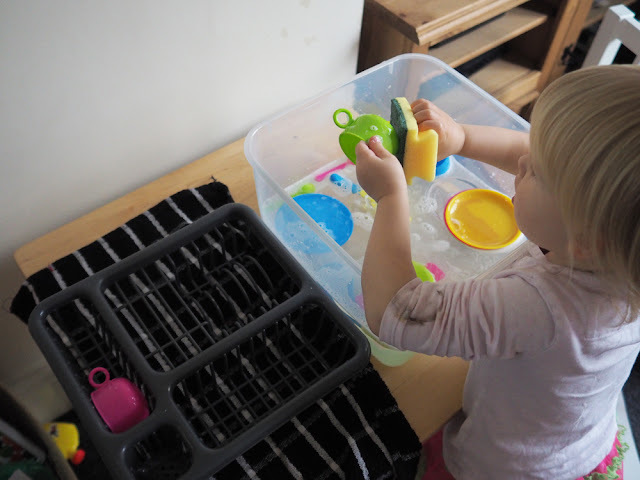 My daughter loves doing the washing up - she's very helpful! Yes, anything to do with water. We only really use the dishwasher but my little boy would love this set! My niece loves washing up which I found quite surprising but I guess it's more fun when you don't HAVE to do it hehe. No hes an 11 year old boy but my 2 year old god daughter loves it! Yes she loves helping me. My nephew loves to help me hoover. splashing in the sink and playing with the water more than washing up . I don't let mu daughter do the washing up as i am OTT and she does not do a good enough job and I have to do them again. My middle boy does but my eldest hates it! My niece is so messy, she never washes up. yep, they bring a chair over and have a go!! We always use the dishwasher, so I don't know. She does love role playing washing up though. my daughter loves helping with any sort of household job! My granddaughter loves helping me with the washing up. We only use the dishwasher but my daughter likes helping me empty it! my son enjoys it a little too much - anything to do with water and we all get soaked! mine doesnt bother so much!! Yeah they do so much . Yes my son loves washing up. Yes although at times they make more mess with the water and bubbles but as long as they are having fun. He loves cleaning ..mostly clothes! We’re not quite at the washing up stage yet but he loves helping to load and unload the washing machine. My niece when she was younger used to love washing up (had to do them again as they weren't always clean enough to put away) but now my great-niece and great-nephew love doing the same. Unfortunately (lol) we have to wash them again, but they do enjoy putting them away and drying the plastic glasses.